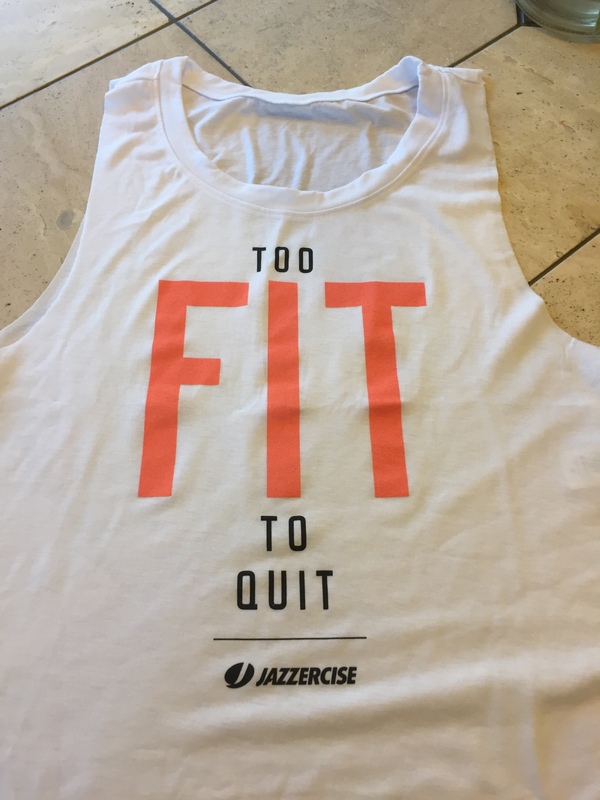 In February, Jazzercise challenged us to complete 30 workouts in 35 days. Seeing as I usually do 3-4 workouts a week, I knew I’d need to step up my game, but wasn’t totally sure my creaky joints would cooperate. My dear friend claims I have a “fragile constitution.” Armed with determination, I informed my family that this challenge might inconvenience them as I usually schedule my workouts around their agenda, but this month, my schedule would be the boss. The first benefit I noticed from working out everyday was how well I slept. Wow! By 9:30 PM, I was out cold and woke up at 5:30 AM rested and raring to go. Then, I encountered my first barrier. My new shoes caused severe ankle pain, which made me miss two days. To make up for lost time, I ventured with trepidation into new territory and attempted my first back-to-back classes. And I survived, albeit with very sore muscles! The next week, while my poor girls were being pancaked during my yearly mammogram, the expert technician somehow injured my shoulder muscle and third rib on a re-take. Ouch! This limited my mobility and caused me to miss four more days of workouts. In my mind, it seemed I was too far behind to finish. My hubby strategically left the country that last week (complicating my chances of getting to the gym every day!). His dad didn’t understand this strange obsession of mine and asked why Frank couldn’t just buy me a nice quality T-shirt. Ha! But, it wasn’t about the T-shirt. It was about pushing myself beyond boundaries I knew I couldn’t achieve on my own. I needed daily prayer and reliance on God (and those hot baths!) to make it through. And then on Day 34, I completed my 30th 60-minute class and became the proud owner of that coveted T-shirt! On my way to pick up Princess from school, I wondered what my perseverance was showing her, if anything. I wasn’t sure how much she’d noticed, but it certainly had inconvenienced her a few times! That brought me the most joy – knowing that she was cheering me on. I can’t imagine how disappointing it might have been for her if I’d given up, even if I’d had a legitimate excuse. I can do far greater things than I think I can when I have like-minded people in the trenches cheering me on. It’s not about the T-shirt! It’s about the journey and the blessings along the way. Each day new barriers will arise, and God will help me through with enough grace for that day. Someone is always watching. I’ve been reminded that our kids are always watching and imitating us. They will do as I do, not as I say. And others are watching me navigate foster care. I am a window into what this unfamiliar world is all about and I need to be transparent by sharing both the joys and the trials. Reminds me of the saying, “the best laid plans …” I’m so proud that you persevered: for yourself, for Princess, as an example to all of us. After 6 days off due to a severe bout of chest & nasal congestion, I made it back on the treadmill today (I rarely miss even one day). Exhausted but proud as well.